WPI professor Marion Emmert holds the drive unit of an all-electric vehicle in her lab at Gateway Park. 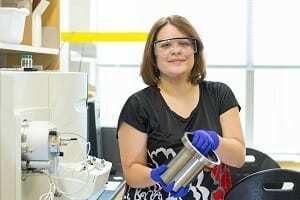 In an effort to help develop a sustainable domestic supply of rare earth elements and lessen the United States’ dependence on China for materials that are vital to the production of electronics, wind turbines, and many other technologies, two researchers at Worcester Polytechnic Institute (WPI) have developed a method of extracting rare earths from the drive units and motors of discarded electric and hybrid cars. With support from WPI’s Center for Resource Recovery and Recycling (CR3), Marion Emmert, assistant professor of chemistry, chemical engineering, and mechanical engineering at WPI, and postdoctoral fellow H.M. Dhammika Bandara conduct research at WPI’s Gateway Park in a specially equipped laboratory, one of the only such facilities of its kind in the nation. Working there, the pair has created the novel method for processing drive units and electric motors to chemically separate rare earth elements – specifically neodymium, dysprosium, and praseodymium – from other materials used to make the devices. The goal is to recycle rare earths that would otherwise be lost in a sustainable and efficient manner. To test the process, the WPI researchers sliced the drive unit (which contains the electric motor and other components of the drive train) of an all-electric Chevrolet Spark vehicle into several pieces and then shredded the pieces. Using a two-step chemical extraction process, they were able to separate the rare earth elements and also recover other recyclable materials, including steel chips and other useful materials from the drive units. The researchers say the technology has the potential to be an alternative source of rare earths, which could lessen the need to import these vital elements from China, which currently supply’s about 97 percent of rare earths used in manufacturing. Furthermore, since magnets containing rare earths are used in a wide range of technologies, including electric motors, wind turbines, and medical imaging devices, including MRI scanners – manufacturers would be able to improve the sustainability of their products by recycling these materials. April 11, 2019 - Recycle Your Batteries, Before China Wins That Race, Too Defense OneWith global demand rising for critical and rare earth materials in new tech, it\'s not too late for the U.S. to secure its own sources. March 19, 2019 - Rare Earth Elements From Manganese Oxide-Rich Sediments: Some New Evidence Of Extraction And Separation Science TrendsAs I wrote in one of my previous articles, the industry is becoming more and more demanding of many metals. The perceived supply risk for essential raw.